Ratatouille is one of Pixar’s most unique films, with the story revolving around a rat who discovers he is incredibly talented when it comes to cooking. It does not sound like an idea that would translate easily to an attraction at a theme park, but then again, the idea did not sound like it would work on the screen either, but we know how that went. 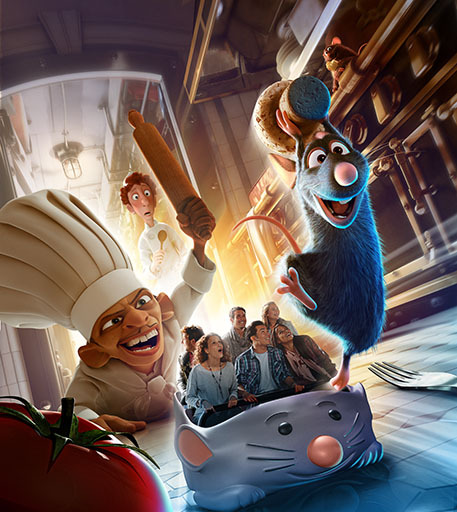 An ambitious Ratatouille ride is on the way to Disneyland Paris this summer and we have just learned its opening date – July 10th! Often times, a location or structure can be just as much of a character in a Pixar movie as any monster, superhero or bug. This is particularly evident in our first PixArt feature of 2013. Artist and designer Mario Graciotti (aka Mr-Bluebird on DeviantArt) brings us this beautifully designed tribute to some of the iconic buildings from Pixar films. Take a close look at each carefully constructed location. Graciotti’s attention to detail is what makes this and all of his other work such a feast for the eyes. Take a closer look at Mario’s artwork and read his story after the break!